You may recall that around the beginning of March, I "brewed" a batch of Simple Hard Cider based on a couple of episodes from Basic Brewing Radio. A couple weeks later, I reported that I had bottled the cider. Several days ago I tried some. It was pretty tart and dry. I didn't get much apple flavor from it, or really much of any flavor other than "tart". I had been stuffed up with a cold and thought I may just not have been able able to taste because I couldn't smell. I probably should have waited from my first taste. I did think the carbonation was about perfect, which was something I had no idea about when I bottled it. Tonight, I was feeling better, so I decided to try another bottle. It was still tart and dry. I got a little bit of apple and just a touch of what might have been cinnamon. I guess it was whatever they spiced the "spiced cider" with. It was ok. Not great. If you are ever visiting and what to try it, let me know. I will most likely still have some for you to try. 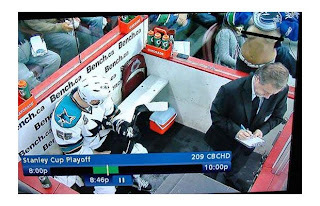 I feel like I should make some sort of funny statement about the Vancouver fan who flashed Ben Eager in the penalty box last night. Unfortunately, I've not been able to come up with something all that amusing to say. I'm sure there are great jokes to be said about "the twins". I'm sure we can say things like "no wonder Eager spent so much time in the penalty box". I'm just not clever enough to nail those jokes. I bet you can find a bunch by going to twitter and searching for "vancouver flasher". I've been cheering against the Canucks, mostly because they beat the Hawks in round one. But another reason I can't cheer for the Canucks is those stupid Green Guys who are always there (although they were not there last night). I guess if the team is replacing the Green Guys with the blond breast flasher, I might have to reanalyze my policy against the team. Of course, she did get kicked out, so maybe I should not reconsider after all. I cannot quite figure out how taking out your breasts and rubbing them against the penalty box glass in front of the opposing player communicates your dislike of that player or his team. I assume Ben likes to look at breasts. Most guys do. I am sure he liked that view better than the upside-down back-side of a man in a green spandex body suit. by the way ... I don't own either of the photos of the Vancouver fan. I also don't have permission to use them. Yes, I am a terrible person. But to give credit where credit is due: I got the first one from 25stanley.com, the article "Ben Eager des Sharks se fait flasher par une fan des Canucks". I am not even sure where I got the second photo from. It is all over the place, so I might even be considering it public domain at this point. For what it is worth, I took the picture of the cider, and I do own the photo. If you want to use it in your own blog, go ahead.